"Who says comfort only comes at a price? The Prestige Condensing Wall Mounted Boiler proves it doesn’t. 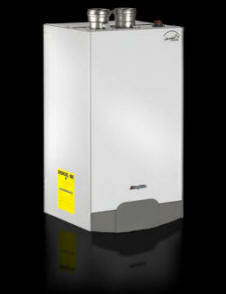 The Prestige boiler features a uniquely designed stainless steel heat exchanger and offers 95% efficiency. The Prestige has the capability to modulate the firing rate to 25% of its rated input and is available in 5 sizes; a 60, 110 Stand Alone, 175, 250 and 399. This modulation means fewer cycles resulting in lower operating costs. A smart and equally convenient User Interface Module displays system status and fully adjustable parameter values as well as diagnostic codes for easy troubleshooting and optimum system performance."